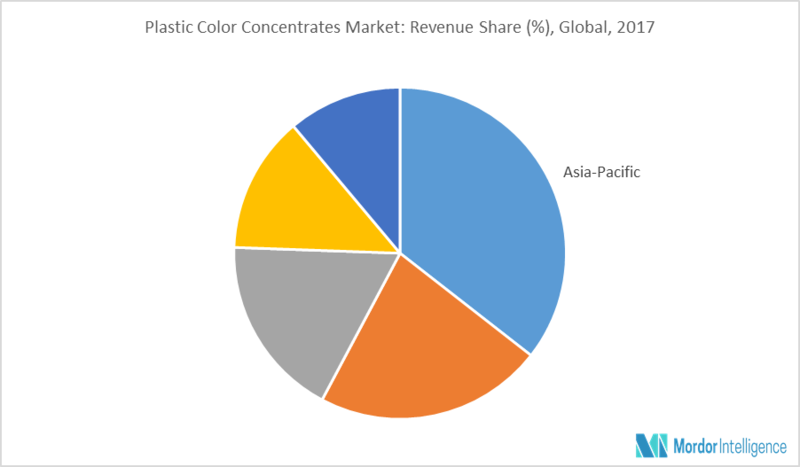 The Plastic Color Concentrates market is estimated to grow at a significant CAGR during the forecast period, 2018 - 2023. The masterbatch segment is expected to be the largest end-user segment. Asia-Pacific is expected to hold the largest market share during the forecast period. Plastic materials, owing to their superior material characteristics, such as heat resistance, strength-to-weight ratio, and chemical stability, are increasingly being used to replace traditional materials, including bronze, stainless steel, and cast iron, during automotive production. Plastic color concentrates, such as masterbatch, ensure that the above needs are sufficed by offering new design opportunities in terms of color and form. Therefore, it makes automobiles resistant to the harsh environmental conditions and also makes them more attractive as well as durable. Masterbatches are used by several technological methods, including injection, blow, and spinning, and are primarily used in packaging, building & construction, consumer goods, automotive, textiles, and other sectors. Masterbatch allows the manufacturer to color raw polymer economically during the plastics manufacturing process. Color masterbatch, which is used for coloring plastics, is widely used in various end-user industries, such as automotive, appliances, etc., to make products look visually appealing. These end-user industries depend heavily on color for their marketing and branding strategies. The color masterbatch is used in the production of plastics for automobiles, electronic appliances, as well as flexible packaging for food & beverages and medicine packaging. The growth of the market in the region is directly linked to the growing plastic industries in different countries in the region. China accounts for the largest share of the market in Asia-Pacific. In 2016, China was the largest producer of plastic materials in the world, accounting for 27.8% of the global plastics production. Moreover, China is the largest in terms of purchasing power parity and is the second-largest economy in terms of nominal GDP. China is one of the lucrative markets for plastic based additives, due to the availability of low-cost raw materials and labor. Other counties in the region, such as India and Japan, are also expected to witness significant growth over the forecast period. Major Players: Clariant International, BASF SE, A Schulman, Polyone Corporation, and Cabot Corporation, among others. 9.5 Changzhou Hongmei Plastic Masterbatch Co., Ltd.